Bappi Lahiri: Very popular among DJ-types a while back, possibly he still is... me, I'm not a big fan. Most of what I've heard is dull, tacky to the extreme, his songs often bland rip-offs from other people's hits. It's with good reason he's referred to as 'The King of Copy'. 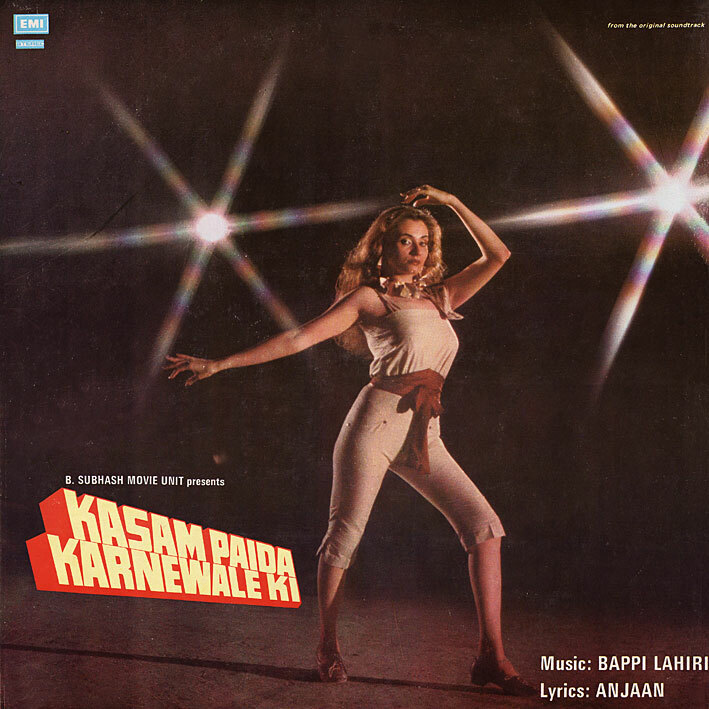 Some of his soundtracks used to fetch ridiculous sums on eBay; 'Gun Master G-9 Surakksha', 'Jyoti' and 'Disco Dancer' to name a few... they might be among the better ones, I wouldn't know. A few of his are OK though, like 'Kasam Paida Karnewale Ki'. Hardly a trace of traditional Indian sounds on this... 'Dance Dance' is the kind of 80s disco you either love or hate (or say you hate but secretly love), 'Jeena Bhi Kya Hai Jeena' is in fact quite good despite (or because of) its shameless steal from 'Billie Jean', and the anthemic title track has its funky moments. But my favourite is 'Come Closer' (now why isn't that on YouTube? ), a gorgeous slowburning lounge-funk number that I once saw described as "Donna Summer meets Ravi Shankar". Sweet! good 80s pop.I use to have this cassette.Am I mistaken or is there a song missing for this soundtrack I am sure there was S.Janki singing a song on this album. I'm a fan of Lahiri and just found this soundtrack a couple of months back. Played it a DJ gig this past weekend and it went down well. this is incredible..cant stop listening to it! where can i buy this soundtrack on CD? I love your blong! I enjoy a lot this music! This link is dead... Can you reupload this album, please? Occasionally. Like when I'm bored a work. Music for the movie "SALMA" has been composed by Laxmikant Pyarelal and not Bappi Lahiri. Indeed, "Come Closer" is a super track ! I actually like the crisp recording :) Excellent for those days ! Thanks a lot! My bad ! Its Bappi da himself for SALMA. Sorry ! Hi PC, can you upload this again ?